Manage your MySQL instances with a comprehensive view of your MySQL server connections. The visual tree-based navigation provides detailed information about server and status variables, including the number of threads, bytes sent and received by clients, buffer allocations size, and more. The Navigator area of the sidebar panel has an Administration secondary tab (previously named Management) with functionality to monitor and configure your selected MySQL connection. On some hosts, the Navigator and Information labels are not shown. The following figure shows the main elements that apply to server management. Server menu. The Server menu on the main menu bar is one way to open each category of administration secondary tab. The menu includes the same set of items listed in the Administration tab within the Navigator area, plus two additional items: Management Access Settings and Reset Saved Passwords for Connection. 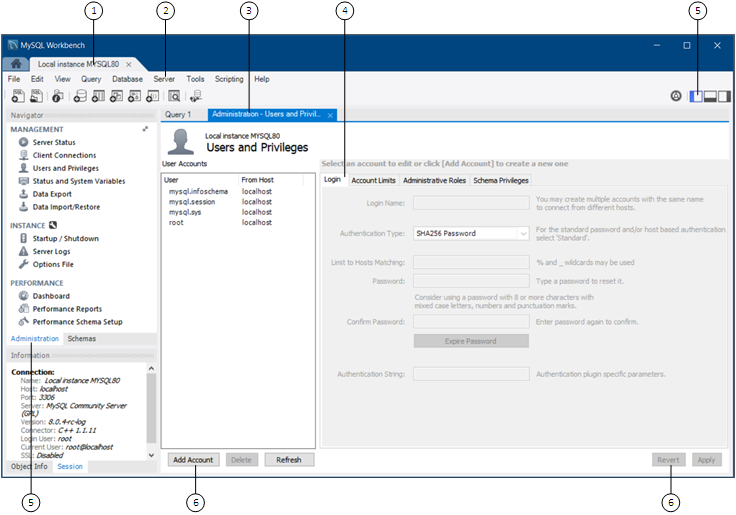 To open the Administration - Users and Privileges secondary tab (see the previous figure), click Server and then Users and Privileges. Administration tab. You can display only one administration tab at a time; subsequent administration tabs replace the active tab. To close an open tab, click the x on the tab. Operation tabs. Some administration secondary tabs also include subtabs that separate the available operations within that category. For example, the Administration - Users and Privileges secondary tab (see the previous figure) has four subtabs: Login, Account Limits, Administrative Roles, and Schema Privileges. Sidebar panel. The sidebar panel includes the Navigator and Information areas. With the Administration tab selected, click any item in the Navigator area to open the related administration tab in the workspace. You can hide or show the panel using the shortcut action in the main toolbar. The previous figure shows only the sidebar panel. The secondary sidebar and output area panels are hidden in this example. The Administration secondary tab is separated into the MANAGEMENT, INSTANCE, and PERFORMANCE sections, and the Commercial edition of MySQL Workbench also includes the MYSQL ENTERPRISE section. The Navigator area also has a Schemas secondary tab for managing databases using your MySQL Connection. For information about the Schemas tab, see Section 8.2.1, “Object Browser and Editor Navigator”. Operation buttons. All buttons within the administration tabs are located in same area of the workspace. However, the set of operation buttons changes depending on the selected tab.